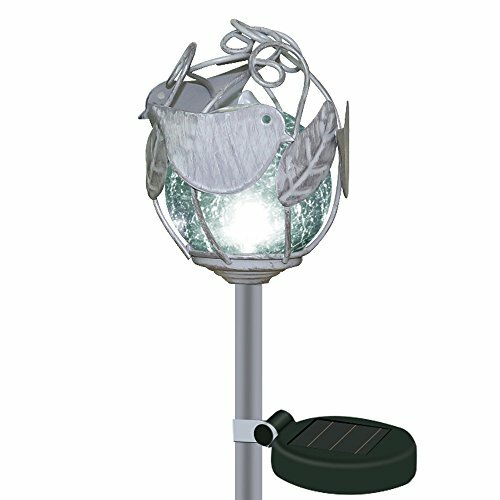 Solar Lights Outdoor, VUV Crackle Ball Solar Light with Decorative Metal Bird Top Stake Lamps Landscape/Pathway Waterproof Lights for Garden/Yard/Driveway/Patio/Path by VUV Tech at List It Fort Worth. Hurry! Limited time offer. Offer valid only while supplies last. MOST DURABLE DECORATIVE GARDEN ACCENTS: Unlike other LED accent decorative lights that are made using cheap plastic, ours feature a rust-proof iron stake and an extra-heavy crackle ball made of real glass. The weatherproof body withstands rain, shine and snow to work perfectly through all the seasons. FULLY SOLAR POWERED: Never have to deal with utility bills or the hassle of constantly changing batteries. These solar powered color changing crackle lights are completely fueled by the sun and are fitted, powers the spinning and lighting action for up to 8 hours on a 8-hour charge. Easy Installation: No wiring required. turn on the switch make the pieces together as picture shows, and directly insert it into soil to complete installation. MOST DURABLE DECORATIVE GARDEN ACCENTS: Unlike other LED accent decorative lights that are made using cheap plastic, ours feature a rust-proof iron stake and an extra-heavy crackle ball made of real glass. If you have any questions about this product by VUV Tech, contact us by completing and submitting the form below. If you are looking for a specif part number, please include it with your message.